Plants to 30-60 cm; bulb 2-4 × 2-3(-4) cm. Leaves: sheaths 3-6 mm, membranous; blade deep green, linear to ligulate, 30-50(-70) × 0.5-2 cm, apex obtuse, glossy, well developed at anthesis. Scape stout, hollow, 2-winged, compressed, (20-)30-60 cm. Spathe bract solitary, fused, green, lanceolate, 3-5 cm. Flowers: tepals white with yellowish green spot near apex, broadly ovate, (10-)13-22 × 10-12 mm; filaments white, slender, 2-5 mm; anthers 5-6 mm; ovary oblong-ovate, 6-10 × 5-8 mm; style clavate, 5-10 mm, exceeding stamens; stigma truncate, inconspicuous; pedicel 2.5-7 cm, longest equaling or exceeding spathe. Seeds black, 5-7 mm; coat loose, with air pockets at each end. 2n = 22, 24. Flowering spring--early summer. Roadsides, fields, waste places; 0--500 m; introduced; N.S. ; Ala., Ark., Conn., Del., Ga., Ill., Ind., Ky., La., Maine, Md., Mass., Miss., N.Y., N.C., Ohio, Pa., S.C., Tenn., Tex., Va.; c, s Europe; naturalized throughout temperate areas. Perennial herb with a bulb flowering stem 20 cm - 0.6 m tall Leaves: basal, deep green, 30 cm - 0.5 m long, 0.5 - 2 cm wide, linear to strap-shaped (ligulate) with a rounded tip. Inflorescence: an upright umbel of two to eight flowers raised on a two-winged, hollow stalk and subtended by a fused, lance-shaped bract. Flowers: on long, drooping stalks, white, edged with green, 1 - 2 cm long, about 1 cm wide, bell-shaped, with six tepals. Stamens six. Fruit: a dehiscent capsule. Seeds black. Habitat and ecology: Introduced from Europe. A commonly planted but rare escape. 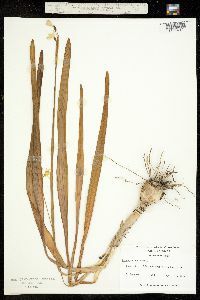 The Porter County specimen was collected from a large colony growing in a wet stream course valley. The soil there is wet, sandy, and mucky. Etymology: Leucojum comes from the Greek words leucos, meaning white, and ion, meaning violet (the flower). Aestivum means "of summer." Scape 2-4 dm; lvs 3-4 dm, ca 1 cm wide, obtuse; bract foliaceous, 3-5 cm; fls 2-8, on long drooping peduncles; perianth campanulate, ca 2 cm, the tep white, edged with green; 2n=22, 24. Native of Europe, locally established in our range as an escape from cult.